WASHINGTON (Oct. 24, 2008) -- The Army has asked the National Institute of Mental Health to conduct a study to get to the root causes of why Soldiers commit suicide. Secretary of the Army Pete Geren, Chief of Staff of the Army Gen. George W. Casey Jr. and Thomas R. Insel, director, National Institute of Mental Health, signed a memorandum of agreement Oct. 23 that spells out the nature of the study. 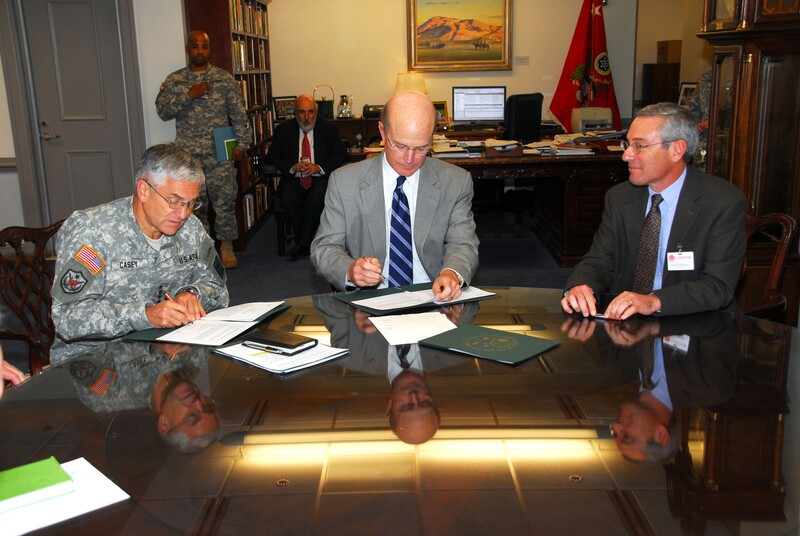 Chief of Staff of the Army Gen. George W. Casey, Secretary of the Army Pete Geren, and Thomas R. Insel, director, National Institute of Mental Health, sign a memorandum of agreement Oct. 23. Under the MOA, the NIMH will conduct a research study for the Army that will focus on the mental and behavioral health of Soldiers, with particular focus on the multiple determinants of suicidal behavior. Under the MOA, the NIMH will conduct research for the Army that will evaluate the many factors that contribute to suicide. The end result will be for the Army to use the study to develop strategies to prevent suicides. "The National Institute of Mental Health has the world's finest researchers in mental health," said Geren. "We are pleased to partner with them in our ongoing efforts to prevent the tragedy of suicide. This collaboration offers an opportunity to make great advances in the understanding of suicide and develop prevention programs and practices." During the study, which is expected to last five years, the NIMH may interview Soldiers, their families and their parents. The study will include the active-duty force in addition to the National Guard and Army Reserve. The Army has seen a steady increase in suicides in recent years. In 2007, there were 115 suicides in the active duty-Army, more than any year since the start of the first Persian Gulf War. The Army considers one suicide one too many, said Casey, adding that the service is working to reduce the number of suicides. "The Army is committed to providing the best resources for suicide awareness, intervention, prevention and follow-up care - all of which are critical in helping Soldiers and family members prevent unnecessary loss of life," Casey said.